Where is the Capital of Alaska? 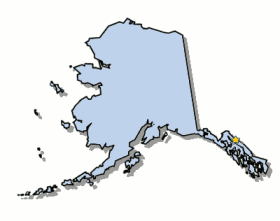 The State of Alaska map (AK) shows the location of the state capital in the "49th State". Alaska has 27 counties, and the capital of the State is Juneau. On a map, the capital city is always indicated by a star. Interesting fun facts about Juneau including its history, location, county, current population, size of the city and the nickname of Juneau. The Map of Alaska provides an outline of the state, which covers 656,425 square miles. The size of the state's capital city, Juneau, is 2,717 square miles. Test your recognition skills of the map of the state, and knowledge of its capital, with our State Maps Quiz Game. The location of Juneau is on the Gastineau Channel in the Alaskan panhandle. The city is located in the borough (county) of Juneau. Each of the 50 states have their own capital city. The city of Juneau is the capital of the state. The capital does not have to be the largest city in the state, but is usually centrally located either geographically or by population. The capital is the prominent city, in a political sense, as being the seat of the general government of the state where the state legislature, senate, governor, mayor and other state offices are located. The State of Alaska is located in the far north west of North America in the Artic and Sub Arctic regions. 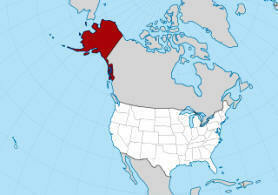 Fact 2: Alaska is the biggest state in the USA. The Number of Boroughs (Counties) total 27. Fact 3: The state covers 656,425 square miles and the size of the capital is 2,717 square miles. Its Nickname is "New York of Alaska "
Fact 4: The city was founded in 1881 and includes Douglas Island, a tidal island located to the west of mainland Juneau. Fact 5: It has been the capital of Alaska since 1906 when the government was transferred from Sitka. Fact 7: Trucks and Cars are transported to and from Juneau by the Alaska Marine Highway ferry system or by barge. Fact 8: Juneau is one of only four state capitals that is not served by an interstate highway. Fact 9: Juneau is one of only four state capitals not served by an interstate highway. Fact 14 on History: Juneau grew from a gold rush boomtown to a center for large-scale hard-rock mining when the loose gold in the stream beds ran out. The number of people, or the population of the capital city of Juneau, obviously changes constantly but the government statistics for the 2012 population of Juneau was 32,556, which provides a good indication of the number of inhabitants of the city. We hope that the interesting facts and information about Juneau will help kids and school children with their homework. Learn more by playing the States and Capitals Game. Nickname "New York of Alaska "